Giving Bitterness another listen before this review, I was reminded of how cruel I can unwittingly be on occasion to excellent bands – giving it an 83 in my review was very short-sighted, considering what an unrelentingly kickass album it is. I’ve updated the score there to be fair, and hopefully that and this review will help renew interest in this excellent yet sadly overlooked band. Comparing Bitterness to comeback effort Counting Our Scars, it’s easy to hear similarities in sound, something which made me very happy indeed and nearly resulted in a top-level score for Desultory. That it didn’t ultimately get that isn’t the band’s fault – anyone listening to opening cut In A Cage will be convinced it’s 1994 again without a doubt, melodic backing mixing with brutally catchy riffing and distinctly Swedish snarls to create a whole that will move your neck automatically. We Death Metalheads have reason to celebrate yet again, as the genre continues to prove it is full of life – whether it’s the bands retreading the classic territory that we know and love to those journeying to lands as yet unexplored, all have their own sound and style to offer, and despite my growing boredom with Black Metal, Death Metal is yet to fall in the same trap. Partly this is due to Death Metal musicians’ ever-growing songwriting skills, something that seems to have been abandoned by their corpsepainted cousins in favour of overambitious attempts at atmosphere. Guess what? A single extended, doomy solo from this album does more to create an atmosphere for me than a thousand post-rock rip-offs from the likes of Krallice, moments like the title track sending shivers down this particular spine without much effort as epic guitar lines shimmer and hover before plunging into an abyss of growls. As ever, you can easily understand frontman Klas’ harsh vocals, and the drumming more than does what its required to do in the songs, rarely going beyond simple beats and blasts. That may seem a little unfair to drummer Thomas, but I mean it as a compliment – bands work best when the members work together, and there are plenty of moments for him to show off without spoiling the effect of the song as a whole. Make no mistake, these are songs rather than ‘pieces’. Melodeath fans currently awaiting the latest In Flames opus should give Desultory a listen to hear how heaviness and melody can be mixed in an emotionally-effective way without compromising one iota. The proggy build-up of Ready To Bleed is a good example of interesting songwriting, the repeated melodies weaving a complex web almost perfectly, whilst the following This Broken Halo whips up a classic Death Metal storm with melody infused, putting to shame every modern band who tries to replicate the same almost without trying. This Moment Is Gone’s opening lead guitar is more epic than Amon Amarth, Uneven Numbers kicks the whole of the last Dark Tranquillity album’s bottom all over the show, and the riffage on Dead Ends is so sharp-edged I thought I had cut myself several times. As for Leeching Life and finale A Crippling Heritage, they may well be the best the band has written. It shouldn’t be a surprise after all that gushing, but as a comeback effort, this is superb. 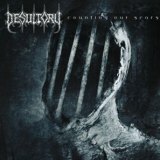 Desultory have managed to update their sound without compromising it or making it sound especially different than it did before. This presents something of a problem for me, as if I score it what it deserves it will look as though I rate it higher than Bitterness – and in some ways, guys, this is honestly better than that excellent album, which I never thought I’d say about any band’s comeback. In any case, I hope that the restrained glee is pretty clear – this is an excellent band that more than deserves your ears. Which album is better? Who cares, get both and try not to hurt yourself headbanging.